All over, softly waved layer define this collar length cut. Style it with a full or partial bang - or no bang at all! 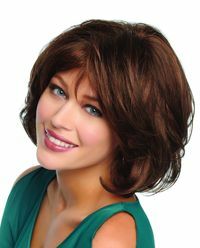 The lace monofilament part allows for off-the-face styling options. Head Shapes Oval, Round, Square, Diamond, Heart, Pear, Oblong face shapes. GL2-6, GL4-8, GL6-30, GL8-10, GL8-29, GL10-12, GL10-14, GL11-25, GL12-14, GL12-16, GL14-16, GL14-22, GL15-26, GL16-27, GL18-23, GL23-101, GL27-22, GL27-29, GL29-31, GL30-32, GL33-130, GL38-48, GL44-51, GL51-56, GL56-60, GL60-101.